Okay, so recently I switched Mab and Titania over from lining their cage pan with newspaper to using absorbent cage liners. They work fine, but I have noticed my babies will often hop down onto the bottom of their cage and start chewing and shredding the edges of the liners through the bottom bars. This isn't something they ever did when I was using newsprint. Should I switch back? Do you have shredding toys available for Mab and Titania? Many budgies love to shred and my females in particular are partial to doing so. If your birds are simply shredding the paper and not eating it, that isn't a problem. I personally use "packing paper" that is available through Amazon as my cage liners. It is also called "newsprint" because it's the type of paper that newspapers are printed on but is actually blank. I line the top of the bottom grate rather than putting the paper underneath the grate. 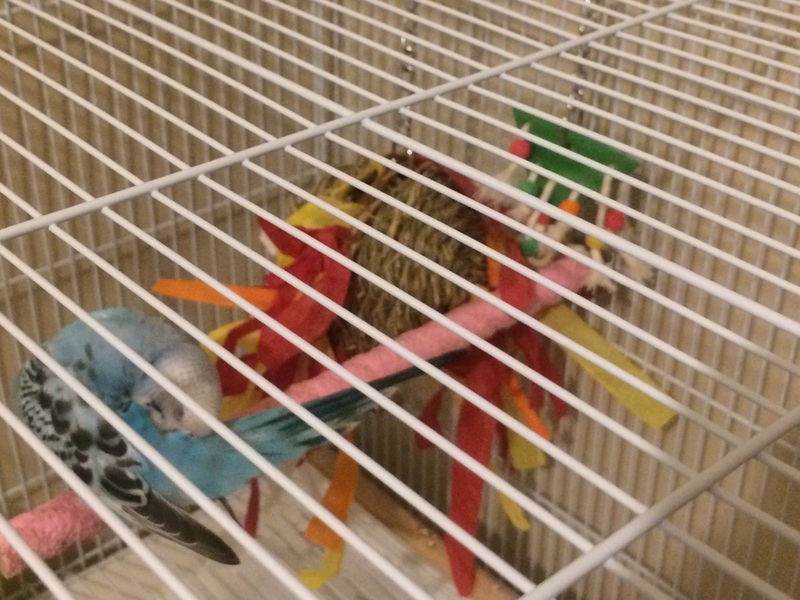 This allows the budgies to walk easily on the floor of their cage, play there and forage for seed which works quite well as long as you change the paper morning and evening. Budgies should only get 1 1/2 to 2 teaspoons of seed each per day. Dividing their seed ration and allowing them to forage for the seeds is a great way for them to utilize their entire cage and is a more natural way of eating for them. I certainly do have destructible toys for them. I have a string of soft-wood plugs that they absolutely love to chew on and shred. As you can see, it's much loved and much chewed by both Mab and Titania. As a matter of fact, one of Mab's favorite games is pulling fibers off the plugs and seeing how much of it she can fill their birdbath with. To date I have never seen them bathe in it. It seems to be a secondary drinking bowl/wood fiber depository. Another toy I have that they adore is this monster. The device Mab is currently cleaning herself in front of is a wicker ball full of tissue paper streamers with a bell on the bottom. This seems to be their all-purpose toy. They tug at streamers, climb on the wicker, pull twigs out of the wicker, play with the bell. They adore the thing. There's plenty for them to shred in the cage without resorting to the liner. The issue is the cage liner has a plastic layer on the underside to stop moisture seeping through and I don't want them ingesting that. Any tips? Edit: Mab also seems to be chewing on the edge of their food bowl which is also plastic so I'm not sure what to do about that either. Last edited by shilohpell; 02-26-2019 at 09:24 PM. Probably shreading the paper will do them no harm. Mine have really ripped up paper on the floor and it did not harm them. 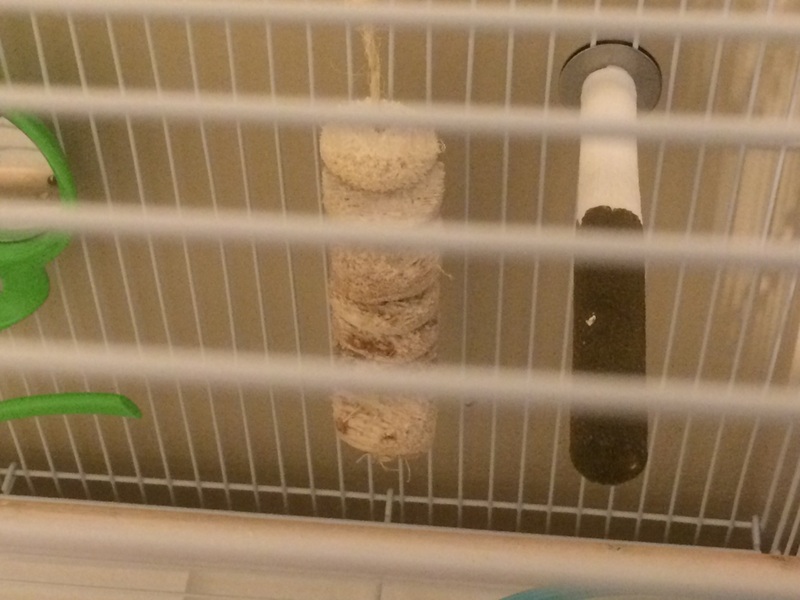 It does distract from the overall neatness of the cage if the birds shread the floor paper. It sure does not loog good if a lot of the paper is shreaded. I'm less concerned with how the cage looks and more with their health. Besides, if they ARE eating the liner, which I don't think they are, and turning their beaks up to the carrots and raspberries I keep offering them, I'm going to be pretty annoyed. 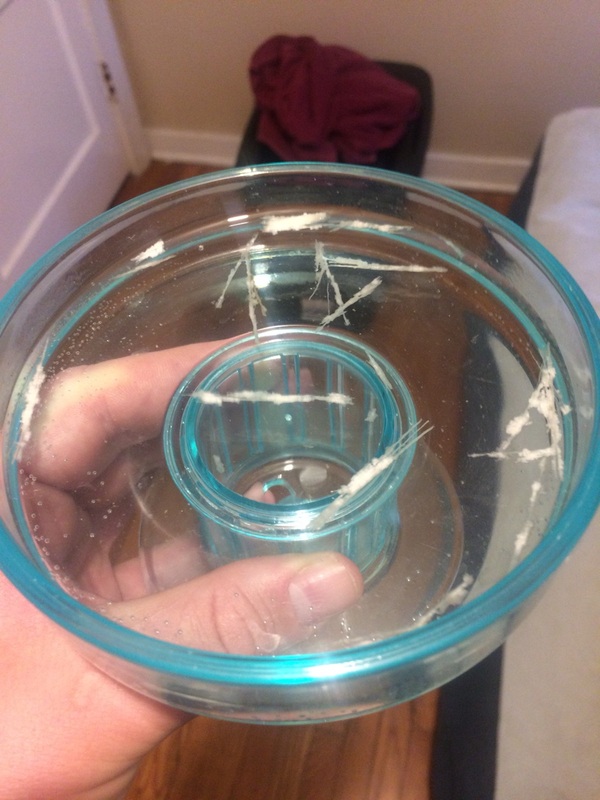 I personally wouldn't recommend using a cage liner with a plastic moisture barrier as your girls are chewing the liner. I'd definitely recommend you change to plain paper for safety's sake. Thanks. That being the case, I'll put them back on the newspaper. My green female does the same as you describe. She is a chewing maniac. She has several shredding toys, along with a dowel ladder she loves to chew. This is not a hormonal thing with her. She is like this all year. It's challenging to keep her in toys. I add extra paper to the bottom of her cage so she can shred that too. Now her male partner is at it too. I have another pair of budgies. They are more normal. Not shredding maniacs. But I did'nt want life to be boring.